Discussion in 'Other Toys/Hobbies' started by Akh-Horus, Aug 14, 2012. I've got the beginnings of a pen collection started. Ok, I have one good pen. Its a Country Comm pen from the USA. Its impossible to kill which is what I was after for work. Got it through www.watchuseek.com and still actively looking at pens and watches. Anyone else into pens? Theres already a thread for watches so lets see about pens. Title changed to "Pens, paper & Ink"
Definitely interested in pens and do enjoy a smooth write but haven't really looked into it as a hobby or things to collect. I got these a few years back after when a customer left them behind, didn't claim it for a few months so boss let me have them. No idea what they are besides a parker, there's an IIIL Marker on the top bit which from a bit research shows they're from 1993. Other than that, no idea. Nice selection of pens there guys. I believe there are a lot of sites dedicated to pens and watches. There seem to be literally hundreds of different pens around, with their own characteristics. If the mods are happy, I wouldnt mind setting up a pen club in OCAU with a dedicated thread, but first thing would be to see what sort of interest there would be in a club like that. Oh man, I'm so bad when it comes to pens. I can't help but buy a new one whenever I'm in a newsagent. My EDC is a cheapy Parker that I got in Primary school when I had my Catholic Confirmation. I like the weight and feel of it. I put Fischer Space pen ink refills inside it for easy flowing awesomeness. I also have a Lamy Safari fountain pen that I keep next to my keyboard. If anyone comes across a copper contry com pen let me know. Been drooling over them but cost new is prohibitive. Anyone used the Smith and Wesson tactical pens? There's a big selection which I am wading through on ebay. I'm more a mechanical pencil guy, though I have a small obsession with pens as well. Fisher Bullet Space Pen Black with Fine black refill. I cant stand broad pens, very fine lines for the win. I have a waterman fountain, but it's not in my pack. My everyday is a lamy safari rollerball, super neat. Everyday pens: Lalex Linea fountain in sterling silver, Sheaffer roller. 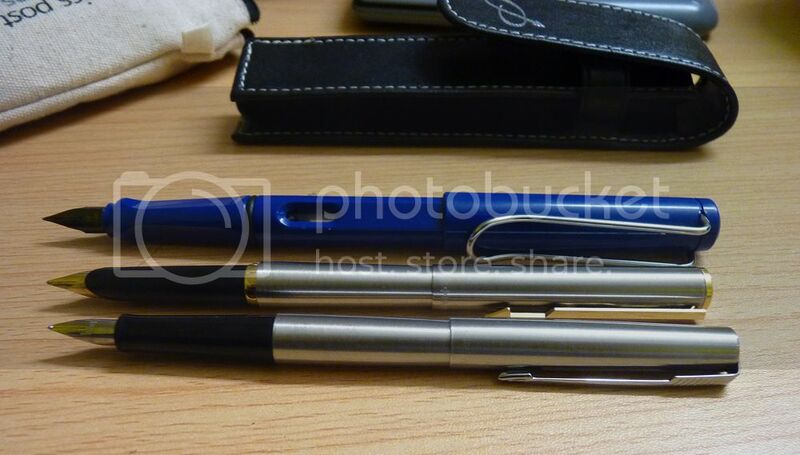 But I've also got a Parker 51 - THE king of pens - Flighter model, all stainless. Some nice looking selections coming through. Opinions and prices on each? My 20 buck parker just blew up on me. It happens with every pen. If it's in my pocket it'll start leaking somehow. I'm a bit partial to Cross. Dad bought me one a few years ago on a trip through an airport, apparently was cheap. 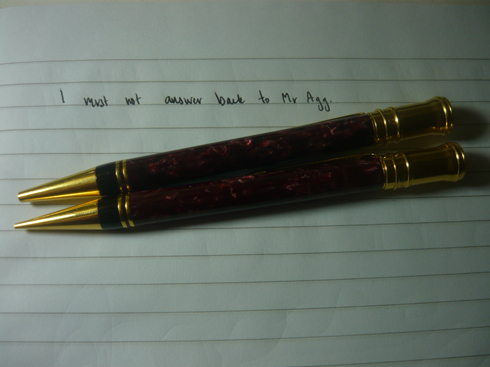 beautiful to write with and good weight. I lost it last year and can't bring myself to buy the cheapest one that I have seen in Singapore Airport, about $70AUD. I think it's a 'Classic Century' style, very thin barrel and single clip. Maybe we can all put in a small precice of our favourite pens.....(did I spell that right?). I only use a small number of regular pens, generally the slim metal Parkers I like the balance and feel using gel refills. I had a nice gold and matte black pen/pencil set years ago until some (&*% in Surrey Hills stole my bag which had them in it. I have a bunch of Lamy Safari FPs which I find are nice and plain enough (still a little bulky but I can live with that). With the ink converters I can easily change the inks to the colours I like. Mostly I use Noodlers Inks just because they seem to be popular, but I'm not blown away by them...the "permanent" inks still run and writing on the back of my hand the regular inks are more permanent. Still it takes ages to go through a bottle of ink so it'll be years before I look for a better ink. I have a couple of different nibs with my Safaris but my day to day pen that sits in my pocket is a fine and works nicely for me. They are only plastic and cheap looking which means I'm not going to get mugged for them, they are only around $30 so as an entry level workhorse pen they are great. Because they aren't $3,000 works of art I don't have to worry about scratching them or anything, its just a pen and it functions very nicely as one. They write smooth and there's something about writing with a fountain pen that I find myself being a bit more careful with my penmanship. I've used (and own) a bunch of other fountain pens under $150 and I think the Lamy Safari is hard to beat for how good the quality is for the price. I've also got a caligraphy set just to play with from time to time (and sometimes nice to write on paper labels with). I've also got a nice Maki-e pens which writes very nicely but I did buy it because of the beautiful Japanese artwork. I don't see myself ever buying a really expensive pen though (the Maki-e is at the cheapest end of the market, pen snobs would say its not a "true" maki-e), I want my pens to be practical and usable on a daily basis rather than something to put in a display cabinet to be admired. Though I am considering a Lamy 2000 too, by all accounts its a fantastic pen and great value for money.